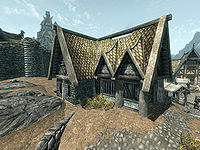 Severio Pelagia's House is a small residence in the Plains District of Whiterun, located between the Drunken Huntsman and the market stalls. It is the home of Severio Pelagia, the owner of Pelagia Farm. It consists of one zone, Severio Pelagia's House. The house is merely used by Severio Pelagia for sleeping, as he tends his farm all day long and spends the evenings at the neighboring tavern. The front door opens to a lit fireplace with a cooking pot, above which hang four bunches of dried elves ear and a salmon. To the right, a lower wall shelf holds two non-respawning sacks while a higher wall shelf holds another non-respawning sack. To the left, a small table holds a salmon steak and a tomato. A wall shelf above holds a goat cheese wheel and a bowl containing five red apples. A few steps lead up to the dinner table which is dressed for four and has an apple pie, a leg of goat, an Eidar cheese wedge, and a bottle of alto wine. Left of the dinner table are a set of shelves with a piece of venison and three bottles of Nord mead, two bottles of alto wine, and a non-respawning large sack. Next to the shelves are two hanging garlic braids. Across from the shelves is a non-respawning dresser and another bottle of alto wine on top. A door to the northwest leads into the small bedroom with Severio's owned bed and a non-respawning wardrobe. 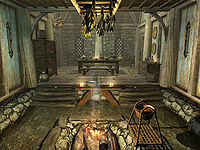 The room to the northeast has a non-respawning wardrobe, a bowl with a gourd, and a small study with a few books: Mysterious Akavir, Darkest Darkness, The Cabin in the Woods, Horker Attacks, and Biography of Barenziah, v3. On the table sits a bottle of Nord mead and a long taffy treat. The front door has a novice lock, the key to which is carried by Severio Pelagia. There is a "Loot" shadowmark on the top right of the door, marked for very minor loot. 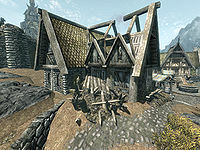 The house is damaged during the Battle for Whiterun and becomes inaccessible afterward. This page was last modified on 8 April 2017, at 00:42.